Between the release of this animated sequel and playing host to this summer’s World Cup, the Brazilian city of Rio de Janeiro is going to be firmly on the map within popular culture this year. And as a follow-up to the decent surprise hit from 2011, Rio 2 is passable enough entertainment for the younger generation who might not be so familiar with the flamboyant cultures that the city possesses. It’s certainly a step up for Blue Sky Studios after last year’s missed opportunity that was Epic, and like its predecessor it is an extremely colourful environment that the animation studio has created. In its pre-credits sequence alone, you can nearly spot all colours of the rainbow covering the winged anthropomorphic characters; and from there, it does not slow down with all types of visual beauty. From the green leaves occupying trees in the Amazonian rainforests to the orange-pink glaze of sunsets, everything looks absolutely gorgeous which makes for a splendid-looking movie. Characters both old and new work fine in the contexts of the story, even though their personalities are not the freshest after being done many times over. As with the last film, Jemaine Clement’s hammy cockatoo antagonist Nigel is one of the funniest standouts, even if his role is admittedly incidental with not much purpose other than to bring back a memorable and popular character. Thankfully, he’s joined alongside the film’s other funniest character, a lovelorn poisonous frog as voiced by Kristin Chenoweth. Their relationship as documented in a melody sung by renowned Broadway actress Chenoweth is surprisingly engaging and interesting, and deals with the ability to love when the lovers can’t even touch or risk death. Though it’s unceremoniously undone by the film’s end, it’s an intriguing little touch that deserved more insight. Instead, we have to deal with what is essentially Meet The Parents mixed with Shrek 2, with feathers and wings. During their trip to the Amazon, they come across the lost family of Anne Hathaway’s Jewel including her Andy Garcia-voiced father – whose reunion is striking in how real it feels, with the emotion coming across as truly genuine and touching – and the rest of the film is Blu (Jesse Eisenberg) trying to do all he can to win the affection of his father-in-law. As you may have already guessed, the storyline isn’t particularly strong and can be very predictable in some circumstances. Maybe it’s because, again, much of the plot has been done many times before so we can see the “twists” coming from a mile off, but in all fairness it is a bit of fun anticipating the big “reveal” before it actually happens. Well, it’s fun for older, more cynical audience members at least. Perhaps the strangest decision for this sequel comes from wanting to insert an environmental theme into the third act, which ends up being distractingly uncomfortable. From the main villain being some sort of kingpin for illegal tree-chopping activities to a cringe-worthy shot of Blu looking over the horrific sight of loggers and bulldozers cutting down helpless trees, it’s a jackhammer over the head in terms of subtlety as the likes of Avatar and FernGully: The Last Rainforest had been before. Everything else had worked okay before, and we really didn’t need the eco-friendly message that feels rather forced. Taking that odd detour out of the equation, you’re left with a passable, if not wholly remarkable animated sequel with some catchy music – continuing on from its Oscar-nominated beats from the first film – and some occasionally good-natured laughs. 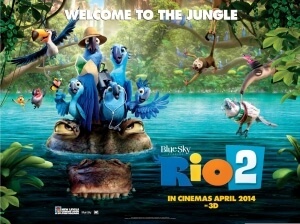 Rio 2 should pave the way nicely for this year’s World Cup in the same city. Oh, and they heavily reduced Tracy Morgan this time round. That was nice of them. Rio 2 is an inoffensive animated sequel with gorgeous animation and childish charm, even though its story and distracting environmental themes lower it from reaching Pixar status. It’s more Despicable Me quality and less Pixar quality, which should be serviceable enough for any family going to the cinema.